I believe in the saying. "AMMK" = ang mahalaga meron ka! so., what are you waiting for.. RATE me! Just made some updates with the steps. We reduced the steps by 1 to improve your Rating Experience with us. The workaround that I'm looking at is to have the points reassigned via the gorated widget by the actual forumites themselves. Konting adjustment lang naman ang gagawin. The points never really went away, it's just waiting to be reborn again. Question: if someone posted a comment/rating on your profile using the gorated widget, does it somehow add points on your reputation power? Looks like the "Reputation Power" is not related to the Rating Widget. I haven't asked our Mods from this. and now 2000000 reputation points..Wohooo! wild guess...I think it has something to do with the no. of post you have in the forum...classifieds not included and the red/green thingy if you set your profile online.. 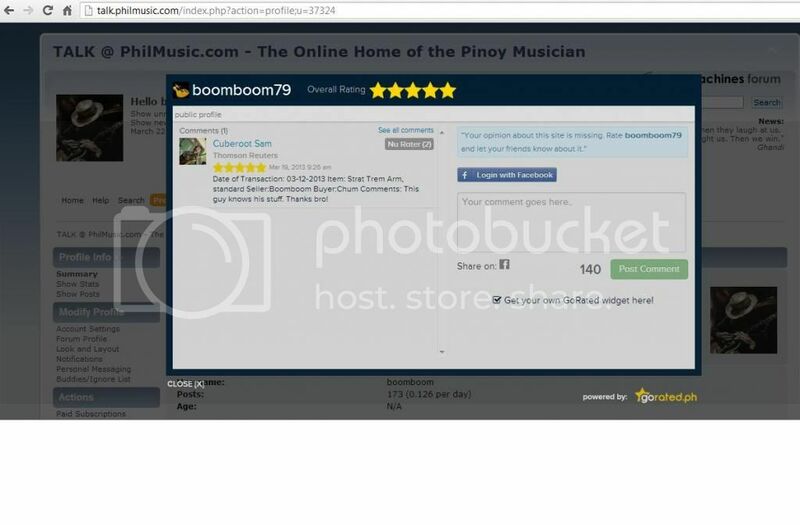 In signing-up with PhilMusic.com, you are filling up forms while with the Rating Widget (GoRated.PH) requires your Facebook account (Social-Proofing) to sign-up for your own Rating Widget. The process is much more easier now since we reduced the process by 1 step. Just to clarify, the reputation power is not in any way related to the gorated widget. It was supposed to be an upgrade from the previous karma feature formerly utilized prior to the introduction of the gorated widget. Please do ignore it for the meantime til corrective action is done. Thanks! How the new and cool PhilMusic.com feedback system looks like. As promised we are continuing to release updates that will improve your experience in using the new the PhilMusic.com feedback system. As of today (April 3, 2012), here are the screenshots of our feedback system. The new version of the rating widget is composed of the seller's overall rating and picture fetch from their currently active Facebook profile photo. The widget view is composed of the following member-buyer's photo, member-buyer's job title/company/location, and member-buyer's testimonial. Re: How the new and cool PhilMusic.com feedback system looks like. How to change the logo, name and message of your rating widget. So far, here are the PhilMusic members that I know with their Rating Widget installed on their PhilMusic profiles. It's ok, just save it on your profile and look at the right side of your profile. As promised, we are pushing more features for the rating widget that will surely benefit the whole community. 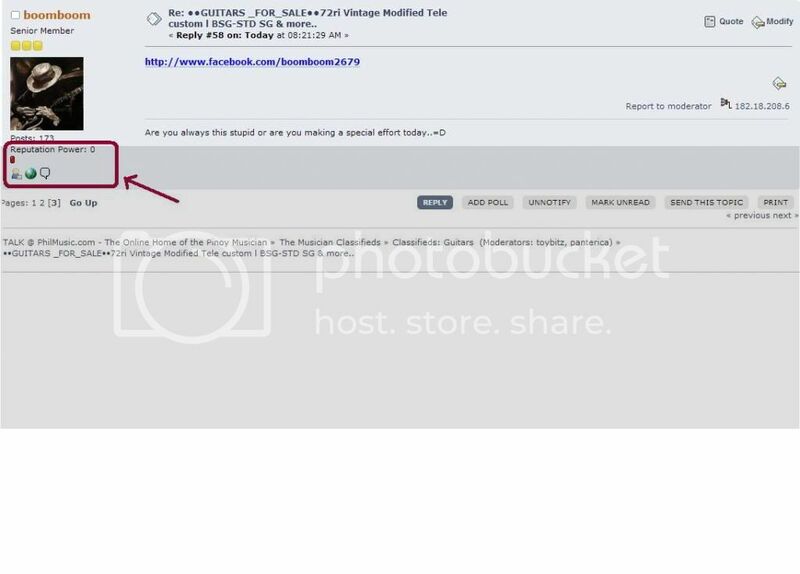 As we all know, the rating widgets can only be seen when we go to each of our forum-profiles. Now, your reputation can also be seen on each of the post that you make by using it as your forum-signature (see the picture below). Step 1: Click the “Get Badge Code” button. On your own dashboard (Make sure that you are logged-in), click the “Get Badge Code” button. Step 2: Copy the code that is compatible to your online community platform. You might be asking, “Which one should I copy?”. Here is a quick tip, if your forum allows to you to input “HTML code” then copy the HTML code. Then if not most probably it will allow you to input BB code, so copy the BB Code instead. Step 3: Pasting the code onto your signature box. Make sure that you are pasting the code on your “signature box”. Congratulations! You now have the badge placed on your forum signature. Page created in 1.169 seconds with 26 queries.